CareCredit is here to help you pay for treatments and procedures your insurance doesn’t cover. We offer No Interest* financing or low minimum monthly payment options so you can get what you want, when you want it. You can even use CareCredit for your family and favorite pet. 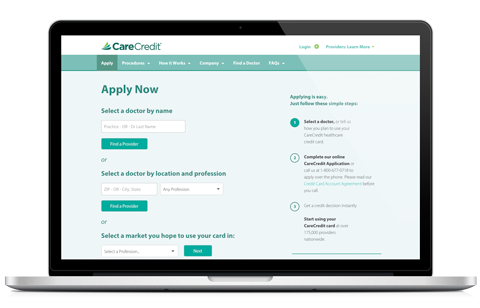 With three simple steps, including an instant approval process, it’s easy to apply for CareCredit. After you’re approved, you’re free to use CareCredit for the services you choose including LASIK, veterinary, dentistry, cosmetic, hearing aids and more. For more information or to apply online, visit www.carecredit.com.